222 pages | 3 B/W Illus. 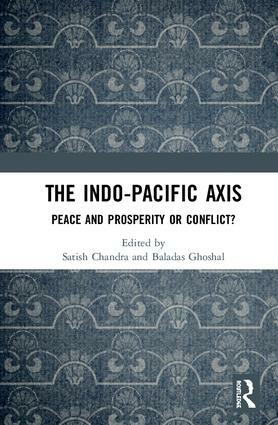 The term ‘Indo-Pacific’ is being used increasingly in the global strategic/geo-political discourse in recent years. The rise of China as an economic giant and a rising military power has led to the consequent shift of international politics and relations to Asia as the fulcrum. It has turned the whole region of Indo-Pacific as one security complex. Countries that are part of the region but also countries that are adjacent or outside the region, but also the countries adjoining the oceans look for a mechanism in accordance with a rule-based order. International law that would protect the rights of the nations to pursue global commons was emphasized. This timely volume presents a collection of articles by leading scholars on the subject from the region. It addresses the faultlines of both traditional and non-traditional security issues. Military modernization, especially of the naval forces of a number of powers, national ambitions of power projection, and plans to build ports in strategic locations are exacerbating insecurity and greater arms race. It also poses the question, whether the Indo-Pacific region will become a theatre of tension and instability, or a contributor to peace and prosperity for the larger populations that reside herein? Please note: Taylor & Francis does not sell or distribute the Hardback in India, Pakistan, Nepal, Bhutan, Bangladesh and Sri Lanka. Satish Chandra retired as Professor of History, Jawaharlal Nehru University, in 1987. Since then he has been active in the Society for Indian Ocean Studies of which he is the Vice-Chairman. He was Chairman, University Grants Commission 1973-81. Baladas Ghoshal is currently Secretary General, Society for Indian Ocean Studies; until recently he was the ICCR Chair in Indian Studies at the Russian State University for the Humanities, Moscow.